The Japanese release of Hyrule Warriors included an art book, which was filled with concept art of characters, costumes and weapons. 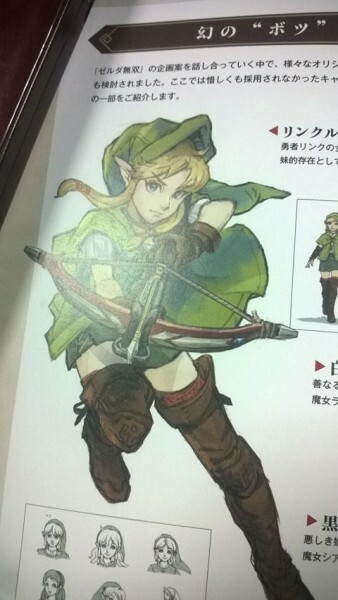 What seemed to cause the biggest stir in the fan community, was the artwork of a cancelled character called “Linkle”. Link and Linkle look very alike with the same hair color and eye shape, as well as similar clothing. It’s not surprising that fans started coming up with theories of her being a female version of Link. Tecmo Koei recently announced that a large, future update is in the works for Hyrule Warriors (not to be confused with the recent 1.2.0 update released today), and asked fans hypothetically which character they’d like to see included. Although it seems unlikely, fans are hopeful that Linkle will make an appearance. This isn’t the first time there has been female Link-based controversy. When Zelda Wii U was announced, Eiji Aonuma claimed that the character in the trailer may not be Link. Fans went wild, coming up with theories of who the character was, the most common being that the hero was a girl. Since then, it has been confirmed that it is in fact Link in the trailer, and that Aonuma was only joking in his previous statement. Credit for the header image goes to Tumblr user layiko.